This is an envelope addressed to Luisa Guagneli when she was interned during WWII at Kingston Penitentiary. Enclosed in this envelope was a letter from her teenage son, Eugene Guagneli. The envelope is postmarked Dec 6, 1940 1PM at Niagara Falls, Ontario and also features the internment camp's censored stamp. Mail correspondence between internees and their families underwent a censorship procedure by the Internment Camps. 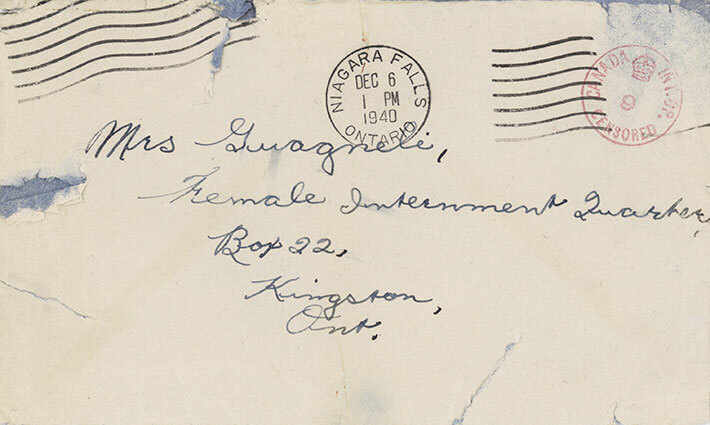 (Handwritten, black ink, centered) Mrs. Guagneli, / Female Internment Quarter / Box 22, Kingston, Ont.